Soft, snow-white sand. Belching sea lions at your feet. Radiantly coloured fish swimming before you. These are the things that come to mind when one daydreams of a visit to the Galapagos Islands. For many, that is all the Galapagos ever is – a mere daydream. It's often dismissed as unfeasible to visit due to its exorbitant costs. But what if you could travel the Galapagos on a first class, all-inclusive cruise with a personal guide for up to a third of the retail cost? What if you could dine and sleep on <$60 a day in one of the world’s most sought-after holiday destinations? I’m happy to tell you that you that this is not a dream, but a feasible reality that we ourselves have done. Intrigued? Here's our ultimate guide on how to see Galapagos on the cheap! 2 How much does a trip to Galapagos cost? 11 What if you don't book a last-minute cruise? First off, yes, you can visit the Galapagos Islands without a tour. This is the most important myth to dispel, as there are four islands that tourists can reside on without being on any sort of tour. These islands are Santa Cruz, San Cristobal (a.k.a. Chatham), Isabela, and Floreana (a.k.a. Charles or Santa Marta). The islands are serviced by ferries. You can fly into the Galapagos yourself and stay on any of these islands. Santa Cruz and San Cristobal are the busiest, most populated islands and have the most to offer in terms of tours, restaurants, and accommodation. However, all of the islands have beaches, sights, and activities which can be explored for cheap or free on your own. For tips on that, read our post here! How much does a trip to Galapagos cost? This depends on how you want to explore the Galapagos, and the flexibility of your trip. If you want to do a pre-booked multi-night cruise, this is the most expensive option. A midpoint alternative would be booking a last minute cruise after arrival. The cheapest approach is to stay on an island and do day tours. In this post we'll compare all of these options! NOTE: By using the right credit card, you can save hundreds of dollars on your trip. For example, foreign transaction fees on most credit and debit cards are up to 3%, which add up quickly over a trip. You should use a no foreign transaction fee card like the Chase Sapphire Preferred to avoid these fees, earn travel points on every purchase, and get a massive sign-up bonus of 60,000 points (worth $750). Alternatively, if paying for your tour in USD on Viator/GetYourGuide, the Chase Freedom card offers a $150 sign-up bonus after spending $500, plus 5% cashback on a bonus purchase category each quarter you activate it, and 1% cashback on all other purchases. So if your first purchase was a $500 tour, you’d get $157.50 back – that’s 31.5% off! Check out our full guide on getting free travel with credit cards here. Basing yourself on an island and taking day tours is the most affordable way to see the Galapagos. Take note once more, there are only four islands in the Galapagos that tourists can stay over on without a tour: Santa Cruz, San Cristobal, Isabela, and Floreana. 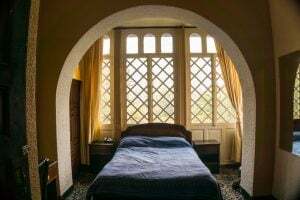 Accommodation: prices start at $25+ USD/night for single, budget private room. A basic budget double room is ~$40 USD/night on average. HotelsCombined.com is comprehensive for Galapagos and includes hostels. AirBNB has comparable listings too. This approach works for those who are flexible with their trip duration and are okay with the possibility of not finding a last minute cruise. If you don't find a last minute cruise, you can simply do land-based day tours/island hopping. 5-night cruise: $800-$1700+ USD total (varies by cruise class, duration, route). This is inclusive of accommodation costs. Note: Keep in mind you must also allocate extra costs for accommodation &/or activities before and after your cruise. A pre-booked cruise is the most costly way to see the Galapagos. This is why people envision The Galapagos as an expensive place. Prices vary by company, class, and route, but you will pay a premium to have a secured spot on a particular ship in advance. There are endless company options, but Viator, Intrepid Tours, and G Adventures are popular and have accessible reviews. 5-night cruise: $2500-$5000+ USD (varies by class, ship, route, etc.). Accommodation costs included. Note: Keep in mind you must also allocate extra costs for accommodation &/or activities before and after your cruise. Prices vary hugely by company, class, boat size, route, and more. Cruise ships charge outrageous prices in advance for their tickets, preying on holiday-goers who have a fixed annual vacation slot to fill. In reality, these seats do not always sell out and as a departure date approaches, remaining tickets are hugely slashed in price to fill the spots. In both the Galapagos and mainland Ecuador (Quito and Guayaquil), there are businesses that operate entirely on selling last minute cruise tickets. Now, one can never guarantee a booking within a set timeframe, but there's usually at least some options within a few days window. The worst case scenario is that you don't book a multi-night cruise and do a land-based approach instead. This is arguably not a bad alternative, given the abundance of wildlife and world-class beaches that can be seen for free or via day tours. We've done this on our second trip to Galapagos, and it worked out great. At the bottom of this article is a map marked with important reference points. It includes where to book last minute tours and cheap/free activities. As the name implies, “last minute” cruises must be booked on short notice – typically a few days before departure. Last minute cruises are booked in person, usually at tour shops that specialize in selling vacant cruise spots. Guayaquil, Quito, and the Galapagos Islands (Santa Cruz and San Cristobal specifically) all have shops that sell discounted tours. Below is a list of shops offering last minute tours. Personally we've only booked on arrival to Galapagos (in Santa Cruz), which is usually the cheapest option. Mainland tourist shops find cruises the exact same way as Galapagos-based companies; that is, by making a phone call to contacts in the islands. However, cruises sold on the mainland often involve increased pressure to book and (false) claims that you definitely won't find cruises on arrival. About: This is a family run business that mainly specializes in last minute cruises. We used them in 2013 to book several day trips and were pleased with their service and the tours themselves. About: This is another family run business that sells day tours and last minute cruises. We used them in 2013 to book our multi-night last minute cruise and were hugely impressed with our first-class cruise! About: Based in Quito and Guayaquil, this company occasionally posts last minute deals on their website, otherwise visit in-person in Quito. Note: this recommendation comes from Frommer's (we haven't personally used them). Address: Quito – Almagro N31-80, Edificio Venecia. Guayaquil – in the Edificio Samborondon Business Center, Torre A Piso 3. About: One of the bigger cruise operators and also has an office in Puerto Ayora. Note: this recommendation comes from Frommer's (we haven't personally used them). About: Has access to ~100 boats and can reach contacts to try and find a last-minute deal. Simply provide your dates and requirements and ask to speak to eh owner, Marcos Endara (tell him you are a Frommer's reader). Note: this recommendation comes from Frommer's (we haven't personally used them). Whatever you do, don't book a last minute tour blindly. Research your preferences ahead of time, including which islands you want to see. Each island and cruise route offers unique wildlife and scenery. Some itineraries focus more on landscapes, while others feature diving or wildlife. There are more “typical” cruise ship routes which include visiting islands that you can see independently on day tours (e.g. Floreana, Bartolome, etc.). These routes tend to be cheaper since they are closer to the main islands, whereas those going to more remote islands are more costly. When choosing a boat and a company, try to look up reviews in advance. Where possible, find out who will be the naturist guide, as this is the wildlife narrator of your entire trip! Trip Advisor is a good place to get trip reports on companies, boats, and tour guides. It can also be a useful place for determining the going rate for full price and last-minute bargains for ships, routes, and classes. As you research, make a shortlist of boats and routes that meet your approval (we've got a handy list below). It will be hard to remember this on the spot, so we really do advise making a “must have” list. You can then cross-check this against the last-minute options available. You may wish to print this out beforehand in case wifi is not accessible. If your holiday time is fixed, you may want to book two weeks off if you want to do a 5-7 day cruise. Buffer room is essential. In our experience, we had 12 days which was plenty to book a 5-night cruise in two days time. It may take a couple days of popping in and out of cruise shops to find a ship/route you like that works with your departure date. Take note that most last minute tour offices only accept cash for tour bookings. Be sure to know your bank’s daily withdrawal limit, bring some cash ahead of time, determine your tour budget and ensure that you can withdraw that amount over a couple of days beforehand to pay for your cruise. When booking, be sure to clarify what is included in the price (meals, diving equipment, tours, etc.). Most often alcohol is not included, so if you want to drink, factor this into your on-board cash stash. Finally, tipping is expected. Be sure to bring cash for this too so you can tip crew members after your tour ends. Tread cautiously around extremely cheap cruises. Reduced costs may be due to under-qualified guides with limited English, or boats that are crammed or unreliable. There's nothing like forking out a wad of cash for a disappointing trip. Know what you want, be prepared to ask questions, then show up and see what's on hand. Here is a checklist when booking! In 2013 we booked a 5-night, first class cruise for less than one third of the retail price. We did so within two days of arrival to Santa Cruz and booked at Joybe Tours. Our boat was The Odyssey, a 16-person yacht that included visited the Isabela, Fernandina, and Bartholomew Islands. We had a very knowledgeable and friendly guide, great food, and tours. It was the rainy season when we visited (December), which meant occasional drizzle, warmer ocean water for swimming, and less tourists. In total, we paid $840 USD each for our all-inclusive first-class cruise. We splashed out on this once-in-a-lifetime experience, but there were cheaper alternatives available. The less pricey options were lower class boats that visited islands we could (and later did) access via day tour. When is the best time of year to visit the Galapagos? The truth is, there are benefits to visiting in different months. Galapagos birds, fish, and animals have different breeding seasons, so you can see surges of particular species at various times of the year. The warm, rainy season is from late December to June. This means warmer waters for swimming, but the chance of cloud and showers (though these are often quick passing). The cool, dry season is from late June to December. “Cool” is a relative term here as the days are still warm but the water is cooler. As the temperatures are a bit more comfortable, this is the breeding season for sea lions, shore birds, fur seals, marine iguanas, which is exciting for wildlife viewing. Peak periods include Christmas/New Years (late December/early January), and June to September. Consider that you will have a harder time finding last minute cruises and accommodation during these periods. It may be wise to at least book accommodation ahead during peak times. The cheapest way to get to Galapagos from Ecuador is between Quito, Ecuador and Baltra Airport, Galapagos (GPS). 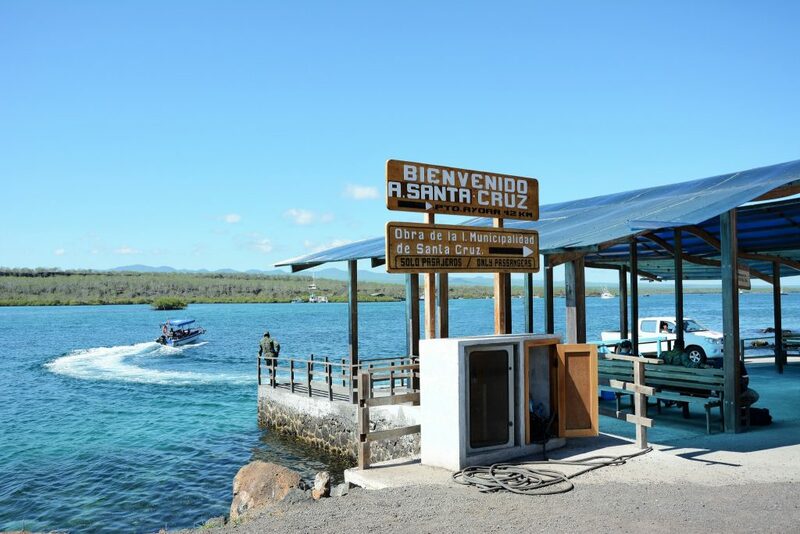 Baltra is the airport for Santa Cruz, even though it is physically located on a different island. After landing in Baltra, tourists are immediately transported to Puorto Ayora, Santa Cruz by bus and ferry. Be sure to have small cash for these transports (a few dollars will suffice). Alternatively, you can pre-book an airport arrival transfer direct to your hotel, which includes all ferry tickets and coach transfers, and the option to stop at the Charles Darwin Station. Departure transfers are also available. If you wish, it is possible to plan an open-jaw trip by flying into one island and out of another. You can transfer between islands by ferry (pre-book on Viator), and fly in or out of San Cristobal (SCY) airport. If you book in advance (~6+ weeks), a flight to Baltra should be around $200+ USD one-way from Quito. You will find the best rates by searching Skyscanner, and we recommend selecting “whole month” when searching to find the cheapest day. If you're not planning to start or end in Quito, try searching from your preceding destination to the Baltra Airport anyway. There's a good chance Skyscanner will be able to find a cheap route between the two points, usually connecting via Quito or Guayaquil. A handful of islands in the Galapagos can be accessed by transfer ferries. You can book these yourself in person by showing up at the relevant dock. Transferring islands is essential if you wish to book an option-jaw flight (flying into one island and out of another). Generally speaking, there is one early morning (e.g. 6AM) and one afternoon (e.g. 2PM) ferry between islands each day. These are general time estimates subject to change, and you must confirm this on arrival as it varies by island. It's recommended to buy ferry tickets the day prior so you know the timing in advance. Prices range from around $20-$60USD one-way depending on the island. As of 2016 prices between San Cristobal and Santa Cruz were $30 USD one way. This website provides a schedule, but we cannot take liability for errors in the schedule or price (confirm in person and in advance of your travel plans). Alternatively, pre-book your island transfer with pickup direct from your hotel on Viator (San Cristobal to Santa Cruz and Santa Cruz to San Cristobal). Before flying into the Galapagos Islands, you'll likely start your trip in Quito or Guayaquil. From there, you can fly to Baltra or San Cristobal and stay in one of four islands where tourists are allowed to stay. These include Santa Cruz, San Cristobal (a.k.a. Chatham), and Floreana (a.k.a. Charles or Santa Marta). The Hotel Plaza Internacional is what I call a budget “boutique” hotel. This colonial-style accommodation will set you back $26 USD/night for a private double room with an ensuite. My best friend and I stayed here in November 2015 on our “flashpacking” trip (i.e. you can get cheaper but this is good value for what it is). We loved the generous free breakfast (eggs are extra but worth it! ), and the gorgeous city view. The hotel staff were very helpful and were always be happy to flag a taxi on our behalf to ensure a fair price. The Villa Garza Inn (read reviews) is another mid-range budget option that is clean, spacious, and with a friendly staff on board. Most attractively this hotel includes FREE transport to and from the airport. The price per night is $44/USD, but factoring in the inclusion of transport, free wifi, and a private ensuite room – this is a pretty good option. Ask the owners for food recommendations nearby, we had phenomenal asado (BBQ meat) up the street! Santa Cruz is the busiest of the four tourist islands. Its capital, Puerto Ayora, is filled with tourist shops, tour booking agencies, bars, and even a small grocery store. There are several land-based activities accessible here, including lava tunnels, a tortoise sanctuary, and a lagoon (check our post here for ideas). Santa Cruz has the most booking agencies for day trips and last minute tours, so this is arguably your best starting point if you're trying to snag a discounted cruise. We stayed at Hotel España (read reviews) in 2013 and once again in November 2015. This is a clean, centrally-located budget option that starts at ~$29USD/night for a single private room with an ensuite. It's definitely a great “flashpacker” style option, especially if you get a room in the newer half of the building. Free functional wifi and a TV are included. The main lobby has hammocks that are perfect for swinging in with a beer at the end of a jam-packed day! San Cristobal is the second busiest of the islands that tourists can stay on. It is noticeably less buzzing and built up, but is still freckled with tourist shops and restaurants. The peace and quiet can certainly be a welcome reprieve from the busyness of Santa Cruz, and it does offer some stunning hikes and snorkel sights accessible on foot. This cute little hostel is clean, fairly close to the main strip, and is colourfully outfitted. During our visit in November 2015 the wifi was strong and so too was the hot water. The owners have created an adorable garden here where guests can lounge. Single rooms start at $25 USD/night. Floreana is the quietest inhabited island, with a population of just 150. Unfortunately (or fortunately! ), the tranquility means far less options for accommodation and dining. Most commonly tourists stay on Santa Cruz and/or San Cristobal, but if your budget allows it, there are definitely more off-the-beaten track vibes to be had here. 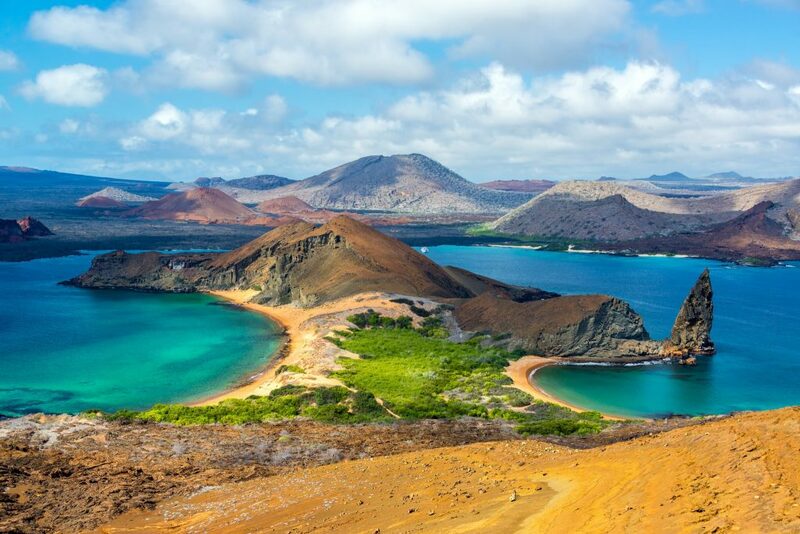 One of the most volcanically active places on earth, this is the largest island in the Galapagos. On offer here is plenty of volcanic landscapes, the second largest volcanic crater on earth, and colourful wildlife including flamingos and sea turtles. We haven't stayed overnight at this island but made a day visit to it during our multi-night cruise in 2013 and it was incredible! Transfers from Santa Cruz to Isabela Island can be pre-booked on Viator. Book in advance or on arrival? Accommodation in Galapagos is a bit pricier to book ahead online, but can be essential during peak travel periods such as Christmas and New Years. We've visited twice (in November and February) and booked accommodation on arrival during these visits. While not booking ahead is a gamble no matter what, you can usually determine how busy it is based on remaining availability on sites like Booking.com. Keep in mind that in South America, many accommodation options are not listed online. Countless times while backpacking we would panic upon discovering no accommodation vacancies online, only to find that there were many (unlisted) places available when we arrived. If you're hesitant to book on arrival, you can always book your first night or two and then explore your options when you get there. For more tricks and websites to help get the best hotel rates when you travel, check out “How to Book the Cheapest Hotel Possible“! What if you don't book a last-minute cruise? Put simply, being land-based is not a bad way to explore the Galapagos. If you aren't looking to visit remote islands or particular diving/spots sights, then you probably won't be disappointed with this option! If you want to see the main highlights of Galapagos – sea lions, volcanic craters, tortoises, marine iguanas, glimmering beaches and the like – you can do all of this being land-based. Remember, you can also island hop to San Cristobal, Santa Cruz, Isabela, and Floreana without a tour, offering your own DIY island exploration. Day tours are highly recommended (do at least a couple!). This will allow you to see islands that you can't access without a tour (which is the majority of them). Prices range from $70-$200+ USD and most include a meal (diving/snorkel trips are priciest). Bartolomé Island is an excellent tour for stunning scenery. 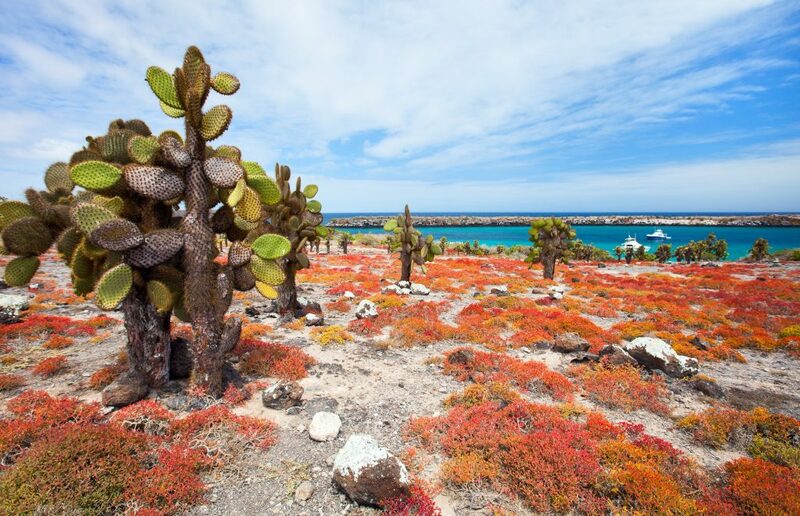 South Plaza Island (Isla Plazas) showcases yellow land iguanas and gorgeous contrasts of red and green flora from cacti and shrubbery. Besides booking tours, you can also visit beaches, lagoons, lava tubes, tortoise reserves entirely on your own. Keen to snorkel or kayak? You can even rent that gear yourself. For detailed ideas on how to explore the islands yourself, check out our article on cheap & free Galapagos activities. If you wander a bit, you'll find Mom and Pop restaurants lining the backstreets, just North of the tourist strip. Prices are around the $5 mark per meal. Take note these are true hole in the wall places (to keep well, check our health tips here to avoid food poisoning!). When in doubt or lost in translation, just ask for the platos del dia or almuerzo (plate of the day) which is usually a tasty, filling combination of soup, salad, rice, and a meat (often fried fish or chicken). Yum! Making your own meals helps stretch the funds here. San Cristobal actually has a small grocery store where you can stockpile items like tuna, bread, and produce for a DIY picnic anywhere. Prices are still shockingly higher than the mainland, but these DIY meals are much cheaper than a meal on the tourist strip. Keep in mind that you cannot bring any produce (e.g. fruit, veg) out of protection for the flora here. Even some packaged goods like nuts may be sacked by airport security. Consider basic accommodation, pack some of your own meals, and/or check out local dining spots to cut costs. Save your budget for tours and exploring! Have you travelled the Galapagos on a shoestring? How did you cut costs? Have a general question or comment on how to do the islands cheaply? Share below!